Fish Stone, Ilkley Moor, in West Yorkshire. Fish Stone, Ilkley Moor, from a different angle. 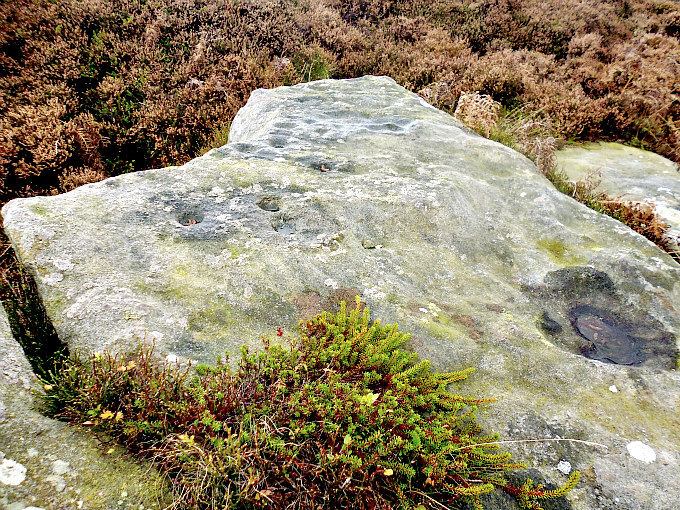 Fish Stone, Ilkley Moor, from yet another angle. 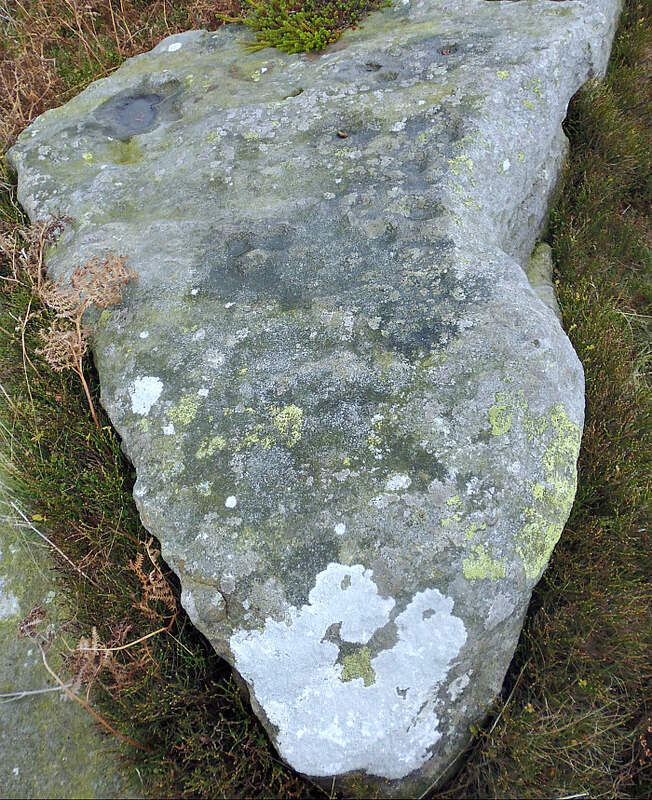 The ‘Fish Stone’ is one of three flat stones here, only the middle one having well-defined pre-historic cup-marks (petroglyphs) on its surface; if there are any on the other two stones they are now faint and worn. There looks to be around 17 cup-markings in the middle and towards the edges of the stone although a some of these may be natural as is the depression at the far side which is due to erosion. Most of the cups are quite small and now fairly worn but they are still visible. There don’t appear to be any rings? But nobody seems to know what these cup-markings are meant to signify – could they be just the idle doodlings of our Bronze Age ancestors, or could they actually be maps showing stars in the night sky, or maybe maps showing burial sites, springs, settlements and other nearby carved rocks; we don’t know with any certainty, so they must therefore remain something of a mystery and ‘an enigma’. If we could travel back in time we could ask the carver of the cups-and-ring markings what he was doing, why he was doing it, and what they were meant to signify. But that’s one for the future! 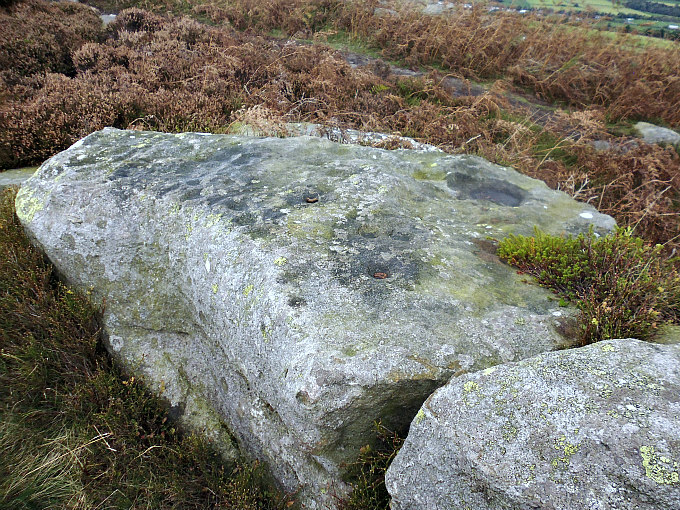 Categories: Cup-Marked Rocks | Tags: Fish Stone on Pancake Ridge on Ilkley Moor in West Yorkshire | Permalink.